Are you one of those individuals who want to enjoy the real flavors of your comfort foods without using oil? If yes, Breville VDF065 Halo Health Fryer is the best kitchen appliance for you. The product is the perfect kitchen tool that offers the healthiest way to fry your favorite chips and cook different delicious foods. Breville VDF065 Halo Health Fryer has a rotating bowl with paddle, halogen-heating element, and reversible roasting rack. With the help and use of this product, you can roast, sauté, bake, cook and fry. This product is perfect for people who are health conscious. Breville VDF065 Halo Health Fryer uses 1 spoon of cooking oil when needed and you don’t have to use cooking oil when cooking frozen foods and oven chips. Today, there are many online stores and companies that offer such product but it is very imperative that you find and choose for a reliable product brand and online store that you can trust. Breville VDF065 Halo Health Fryer only requires 1 spoon of cooking oil when needed and you don’t need to use oil when cooking your favorite frozen foods and oven chips. The product comes with non-sticky rotating bowl and removable paddle that gives crispy and browning results. 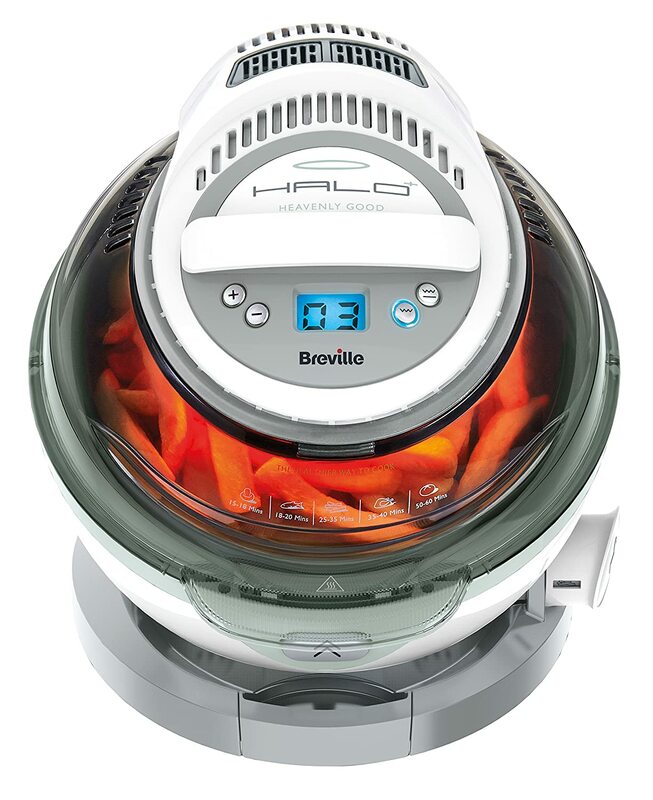 Breville VDF065 Halo Health Fryer can be used with or without the removable paddle to roast, sauté, bake, cook and fry. The product uses double action cooking method. It simply means that you don’t need to preheat. Breville VDF065 Halo Health Fryer has reversible roasting rack to cook delicate foods like fish. It also includes cooking guide with different recipes and measuring spoon. The design of removable paddle and bowl allows for complete versatility to cook not only oven chips, but also delicate foods like fish. The product caters for spicy samosas, spring rolls, succulent chops, crispy chips, fish, uncoated or coated chicken, frozen foods or fresh foods. You can also use Breville VDF065 Halo Health Fryer when preparing red wine sausages or chicken korma. You can also cook homemade, steak, burgers and sausages. You can use the roasting rack when cooking delicate and smaller foods such as roast chicken, sausages or fish. With instant heating, Breville VDF065 Halo Health Fryer is ready to cook and pre-heat time is not required. The halogen element of the products offers an instant heat source. In addition to this, the halogen element illuminates the interior part of the bowl in order for you to easily see the overall cooking procedure. The digital controls of the product can be easily used. This will allow you to monitor the cooking time and countdown. The product is easy and simple to clean. Breville VDF065 Halo Health Fryer is quite expensive to buy. It means that not all people who want to purchase this product can afford to buy one. The product is badly designed. For those people who are conscious about their diet and lifestyle, Breville VDF065 Halo Health Fryer is the perfect kitchen tool for you to use. Since it doesn’t use oil when cooking oven fries, you are assured that your overall health will not be compromised.